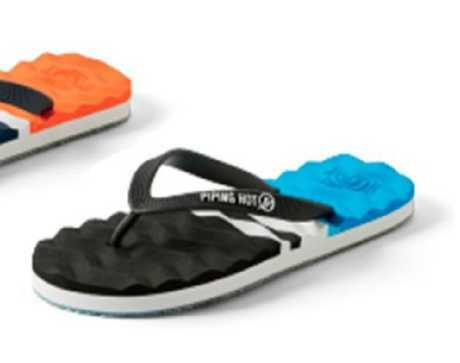 WITH summer right around the corner, Target's product recall of this popular warm-weather item won't be ideal for some Aussies. 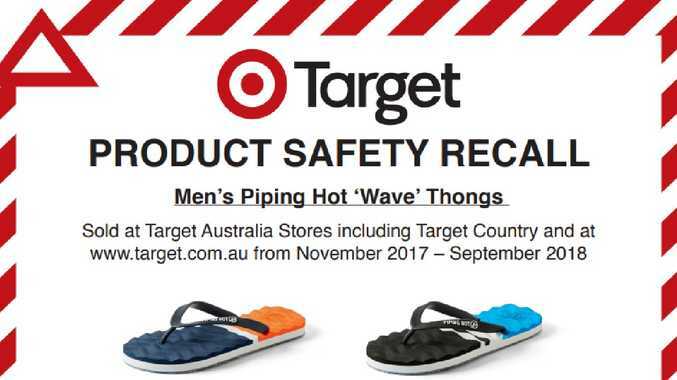 The retail giant has issued a safety warning to those who purchased men's Piping Hot Wave thongs in sizes 6-13 as they present a "possible slip hazard". The design by the popular brand of thongs "have not been made in accordance with Target's quality standards," the company said in a statement. "The thong sole surface of these batches may present a slip hazard," stated the product safety recall notice issued on Friday. Customers who have purchased the thongs, have been advised to return the product to a Target or Target Country store "as soon as possible." The safety recall recommends people who have purchased the product to stop wearing the footwear and return them to the store where members of the team will provide them with a full refund. "A receipt is not required to obtain a refund." Target has explained. If you require further information on the safety recall, visit Target customer support or call 1300 753 567.